Day 47: Don't Hate Me Because I'm Beautiful, originally uploaded by Here Be Dragons. 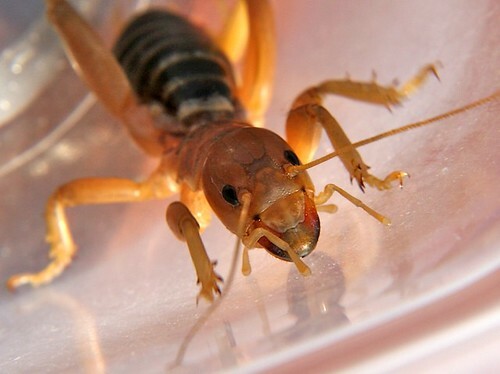 Last night, a Jerusalem cricket wandered into our house, so of course I decided to make this interesting insect (who is not really a cricket, nor from Jerusalem) the subject of my Project 365 photo for today. After taking some pictures, I released it into my garden, where it immediately burrowed under the dirt (trying to get away from the monstrous creature which had been carrying it around, no doubt). A few more photos can be found in this Flickr photoset. LOL! But he's so CUTE!!!!!!! It is 'make do'. Nice insect! Eep! I haven't seen a potato bug in years. (Not since moving away from CA almost 20 years ago.) I had all but forgotten about them. Yikes--they sure look nastier than than they ar. Eeek!!! Yuck! I hate potato bugs! Stomp it! Squish it! *Shudders* That reminds me of when I was outside wating for the postman to finish delivering our mail the other day. A big, black beetle hit the side of my face, fell at my feet, and slowly scuttled away. I let it live, but I was a bit freaked out! Wow, we don't get those here. If you ignore the wiggly legs, he looks kind of like Donald Duck! Never been a fan of most insects. Eek. I had to go see this right before bed. Arachnids I can live with. They eat bugs. Insects? Not so much. I've never seen one of these things (and I hope I never do). When I was a kid, what we referred to as "potato bugs" were sowbugs (some call them "roly-poly" bugs).